Adam and Shannah revealed more of the southern recess of Structure One. On many archaeological sites, each day can bring a different pace of activity and excitement, and today is definitely a step-change from yesterday. For a start, the weather (yes, the weather again) is cooler and less soporific. So cool, in fact, that one of today’s visitors, clutching a scarf to her neck, was moved to ask why Neolithic folk chose to build in such, nasty, windy, exposed locations. One answer to that is that, in the Later Neolithic when the Ness of Brodgar was in its full glory, the weather was a little better than it is now. Somehow, that didn’t seem to mollify her. If the weather wasn’t ideal, the archaeology was definitely in the classic Ness mould. 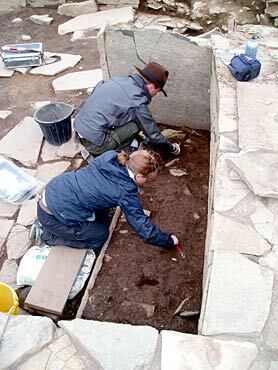 In Structure Ten, Mike, Claire and their team were happily removing midden from one side of the large hearth when a void suddenly appeared beneath them. Cautious probing with a ranging arrow failed to find the bottom. As ranging arrows are at least 12 inches long, this is clearly a void of some significance. Suggestions that the hearth is “floating” are not being received kindly. The central midden, just to the north of Structure Twelve, and lapping up against the structure walls around the entrance area, continues to pour Grooved Ware pottery. Jo’s fabulous piece of decorated Grooved Ware. We mentioned yesterday Jo and her magnificent slab of pottery with applied decoration. Today, she uncovered the rim, which is plain (at least on the exterior) with two little raised “lugs” on top. This will be lifted shortly and, although nobody doubts it will have to come out in several pieces, it has already firmed up a little by being allowed to dry out slightly. Fingers crossed! Alongside it was a tiny, delicate rim sherd, which would have happily passed for the finest Late Iron Age pottery if found elsewhere in Orkney. 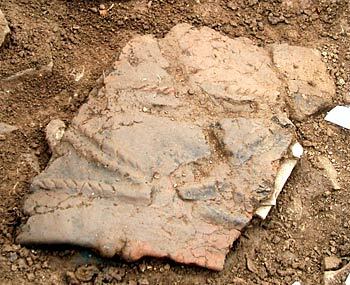 In Structure Twelve, a nice rim sherd emerged, decorated with incised lines on an interior bevel. Clearly, there is much more of this to come. 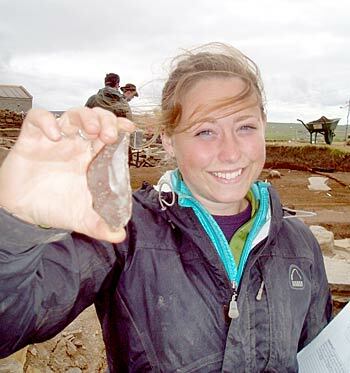 Shannah shows off her ‘star’ flint find. Structure One has had an eventful day. Shannah found, in the southern recess, a big, red, flint blade, carefully retouched, a most handsome object. The structure’s reputation for containing large amounts of Neolithic art was reinforced by the discovery, sitting just behind a wall-head stone, of a wonderful stone block, lavishly decorated with lightly incised zig-zags, cross-hatching and chevrons. In Structure Eight, Dave and Andy have finished the fine midden sections ready for micromorphological sampling, which will give valuable insights into the way into which the site was formed and evolved over time. The plethora of finds has also meant that the Total Station that records their position in three dimensions has been in use non stop today. This information will be used to look for patterns and concentrations in the distribution for the different categories of material across the site. Catherine and Murray have done a great job keeping up with this incessant flow of recording. In addition, students, were inducted into the doubtful delights of the planning process by Nick, who has also, worryingly, taken to stroking his chin and murmuring the words “site phasing”. More of that later (or maybe not). 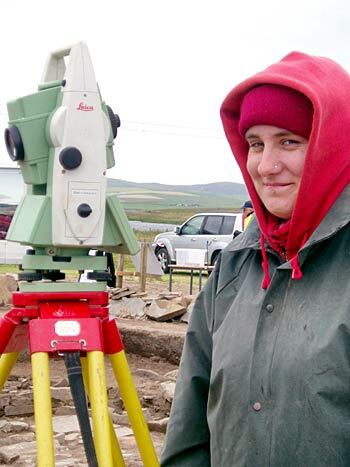 Murray using the Total Station to record find locations in 3-D.
Hello, my name is Dain; I am a UHI student and a volunteer, returning from last year to continue working on the Ness of Brodgar. Last year I came to the Ness as a module of my degree in cultural studies and ended staying for four extra weeks beyond the two required for the module. I am glad to say I am back for another six weeks this year, both for the excavation practice and because digging on the Ness is great fun and a privilege to be involved with. This season I am working in Structure Twelve, bringing down the central midden deposits inside the building to get closer to the floor deposits which are important for dating and understanding the structure. Yesterday, I got a break from the midden and was at the bottom of one of several robber cuts, where stones from the outer walls were removed to be reused elsewhere on the site. By the end of the day, a small section of the clay wall bed was exposed and recorded giving a clearer picture of how the stones were removed. Today, I am in the midden again and hopefully over the next few days will be able to resolve a section of ephemeral walling that has appeared inside Structure Twelve. In the meantime, I, and my fellow diggers, have been uncovering a fair bit of pottery, a handfull of flint and even an incised stone in the midden over the last couple of days. It is great to back on site and it is hard to believe it has already been a week and a half. Time moves in strange ways on the Ness and on first stepping on to the site this year it hardly seemed like any time had lapsed at all. Even though the dig has barely started, it is already shaping up to be a great season and I am looking forward to seeing how the whole site transforms over the next weeks and what new discoveries will be made.